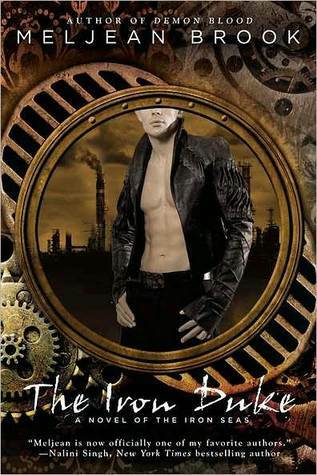 Reading steampunk. So far very good. It's not paranormal, but a very unique universe full of prudish Victorians and nanobug automatons. Knitting the periodic table. Possibly the weirdest thing I have ever knit. For a collaborative project for the International Year of Chemistry - more info here . Long ago I went to University and spent four years studying chemistry (it seems wierd to think that now) so I couldn't pass up the opportunity to be involved. 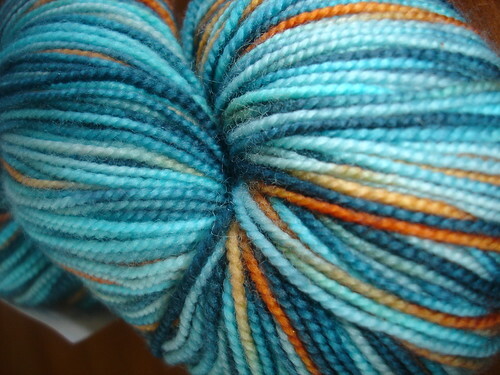 Stashing Fibre Alive Merino Mania (sock) - a 30% sale on my favourite NZ yarn? No brainer stash enhancements. Colourways - Moonlight Sonata (top), Marine (bottom left), Hydra, Plum Surprise. Time Wasting. www.Pinterest.com. Need I say more. Listening to new (listen online) single from Midnight Youth. Love these guys and looking forward to the new album. One of the fun parts about moving to a new place is exploring. 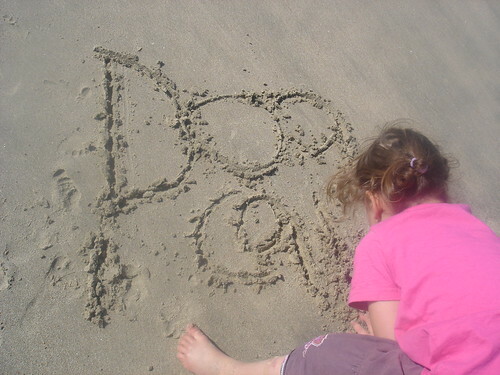 We spent the weekend checking out some of the local coast line - just 15 or so minutes from home. 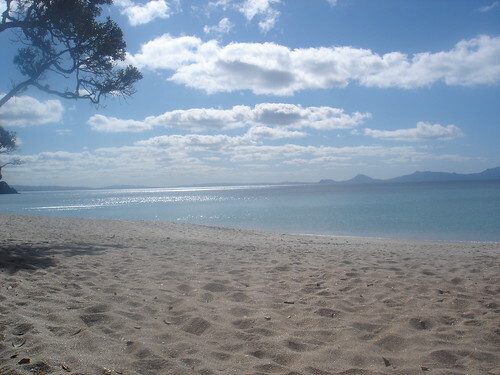 Langs Beach - beautiful white sand, views out to the Hen & Chicken Islands, just stunning. I look at this photo and find it hard to believe it is still officially winter. We skyped my auntie in Christchurch earlier in the day and she still had lumps of snow around her house from the big snow dump they had earlier in the week. The weather here is amazing. The perfect spot for some knitting while the kids paddle. (wip is a blanket square - nice portable easy knitting on the go). The kids had a great time playing in the huge 'perfect for climbing' trees at the top of the beach. Soaking up some winter sun and making sand angels. What a perfect way to spend a winter's afternoon. I'm getting a bit of a head start on my Christmas knitting - I'd like to say that this came about because of an extraordinary amount of organisation and planning on my behalf but the truth is, I was simply craving some no-thinking garter stitch. I've been really tired - (nearly) a year of earthquake stress and post-move exhaustion have finally caught up with me. I've been taking things slow and just needed a mindless knit to keep my hands busy as my body and mind recoup. So a Hitchhiker for my sister it was. I knit this in some Tri'Coterie Organic Vegan cotton yarn for my sister who is 16 and going through the animal rights activism/vegetarian phase. I know I'm taking a bit of a risk knitting something for Her Royal Fussiness, but I hope even if the colours or pattern are wrong the "greenie" yarn will make up for it. This is the third hitchhiker I have made. One was for myself from some super soft bamboo/merino which I wear all the time. It is probably my most favourite item I have ever made and it definitely gets the most wear. Second was a mini modified version for M4. And this third one in cotton - beautiful drape and lovely and light - hopefully it will be nice to wear in warmer months too. 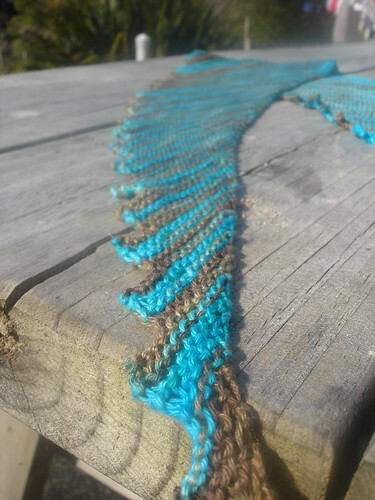 I love how the hitchhiker looks worn - it is such an easy pattern to knit but such a stunning result. I was knitting this at my local knitting group and spread the hitchhiker love - now another of the ladies has not only joined Ravelry but has started knitting her own hitchhiker too. She's using a variegated wool sock yarn which looks great - this pattern is a great one to show off hand dyed or variegated yarns. 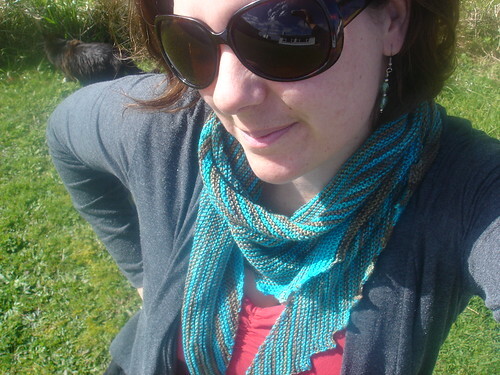 I am sure there are more of these versatile scarves in my knitting future! I do love both the finished product and the ease of knitting. 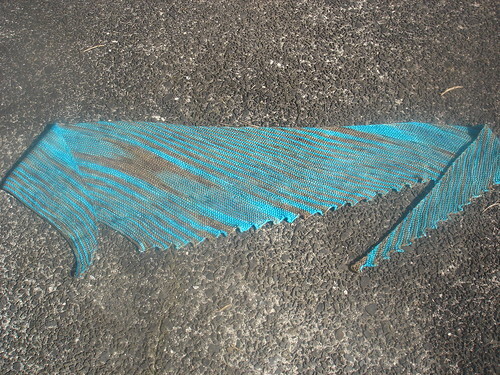 My hitchhiker also meets all the requirements for my 11 shawls in 2011 goal so I am 8 down and only 3 to go! (Actually it's really only 1 as I have one shawl design completed but it has to stay secret for now, and another that I am hoping to release in a week or two. 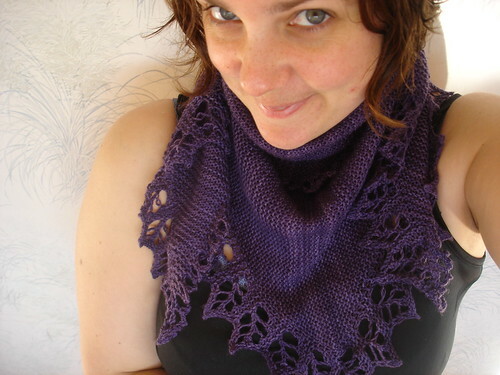 I have another prototype to knit and then I'll be looking for test knitters). I am surprised by how many I have knit actually - it certainly doesnt seem that many!! What are you knitting at the moment? I realised I haven't written a book post for awhile and when I checked back I'm a couple of months behind so today's post will cover June and July. At some point during June I reached my 52 books in 52 weeks goal. It seems like a lot of books doesn't it? I do tend to read a bit of YA which helps. I usually have 3 books on the go at once - one audio, one e-book (which I read on my ipod touch while I save up to buy a kindle) and one normal book. Having reached the magical 52, I've decided to aim for 100 books this year - wish me luck! So the best from June and July? This one is ...interesting. I listened to it as an audio book (free from the library's Overdrive collection) and currently rate it as one of the best audio books I have ever listened to. It takes a little to get used to but it was very cleverly done. The premise is one of futuristic society where the internet has been taken to the extreme and implanted into people's head as a direct "feed". Can you imagine being bombarded all day by jingles and adverts directly into your brain? Chatting with your friends via the feed instead of actually talking? This book is a brilliant piece of satire of an almost depressingly realistic futuristic dystopian society where intelligence and free thinking have been replaced by a society that revolves around the magical feed. About ten years ago I read Pillars of the Earth and still rate it amongst my all time favourite books. It centres about the building of a cathedral in twelfth century England and was an epic tale of love and treachery. World without End is a sequel of sorts - set in the same town but 2oo years later. It is a little bit like a medieval soap opera but I loved every page. Another "big" book by the same author, this time set during World War 1. I have to admit to not really knowing alot about WW1, or the causes and could never really understand how an assassination could lead to four years of war across Europe, so the historical aspects of this book were really interesting. In Follett's usual style there is a whole cast of characters and they each have their own story to tell - the Russian peasant turned solider, the German aristocrat who suddenly finds himself as the enemy, the English ladies of society, the Welsh miners, with the history (Word War 1, the Russian revolution, the suffragette movement) cleverly woven into the background. Not a quick read at almost 1000pages but one that is engrossing and I am very much looking forward to reading the two planned sequels in this new series. This is a New Zealand novel that was nominated for the Man Booker prize in 2007. It's set somewhere in Papua New Guinea during the civil war, a time where soldiers with machetes lurked in the forests and everyone who could has fled the island. In a small village Matilda and her classmates cling to a sliver of normality by attending school with their self appointed teacher Mr Watts - the only white man who has stayed, with his strange ways and their one and only textbook - Great Expectations. Mr Pip is not a long book - 200 pages that I read in a few hours - but the sparseness of the storytelling suit both the isolated nature of the setting and the first person narrative. Overall a riveting, if heartbreaking, read. I listened to this as an audio over 2 nights. The audio was really well done with an excellent narrator for both Clay and Hannah - because the story is half narrated by Hannah as cassette tapes, the audio gives it an authentic real feeling with the pauses, Clay pushing the play button and hannah's voice cutting in etc. The story unfolds with a brutual stark honesty that really rung true for me. The descriptions of the cruelty and fickleness of high school reminded me of incidents that happened in my own school. I often find myself, as an adult reading YA, that "high school" novels (particularly US ones where the schooling system is slightly different to ours)make me feel disconnected, (read: old) but this one had such an authentic, real, here and now, feel to it that I was completely engrossed. The subject matter is unflinching, but as brutal as each of the 'episodes' is, I felt only more compelled to keep listening, to find out what finally tipped the snowball down the mountain. I'm not going to bother to read the negative reviews here though I am sure there are many given the sensitive nature of the plot. I thought this was an excellent novel, one that I hope my own daughters will read when they are old enough.Must read. And finally, Doomsday Book by Connie Willis. Back in May I read Black Out/All Clear also by Willis which were enjoyable, if way too long. Doomsday book is something of a prequel to these books, set in the same Oxford where time travel is possible. In this book an intrepid historian finds herself sent back to the 14th century in the midst of the Plague. I had some of the same gripes that I had with BO/AC in that there is an awful lot of dithering about and an overuse of cliffhangers at the end of chapters - last time it was tube train doors closing before they could reach someone, this time it was the flu making people unconscious before they could impart the all important life saving piece of information. Once the action finally picked up I enjoyed it more and there were some wonderful descriptions of life in the 13oo's. I won't be rushing to read any more of Willis's books but for a taste of time travel meets historical fiction this is a good place to start. Currently I am reading the 4th book of the simply delightful Parasol Protectorate books by Gail Carringer which will definitely get their own review next month. What have you been reading? Treats! (lots of candy, some we can get, some are totally new to me like the Hot Tamales (omg so weirdly good) and the Coffee Crisps - OMG these are DELISH) Also some yummy looking coffee AND BURT BEES!!! - have often heard how good this stuff is but I've only ever seen it once here and it was ridiculously expensive. 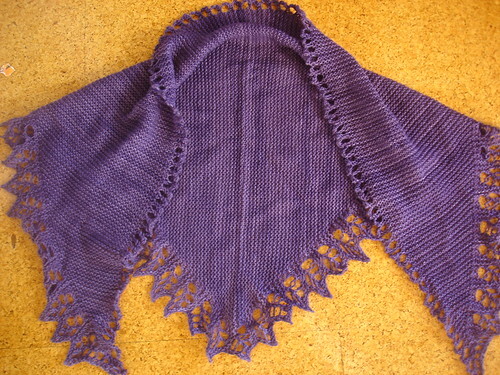 A PURPLE shawl. I am totally in a purple phase at the moment. Made in Malabrigo sock which is ridiculously soft and airy light and so divine. The pattern is Pettine - which is so cute because not only did my lovely swapper and I send to each other but we made the same shawl. Great Minds truly do think alike.